JAMB 2018/2019 is not yet out. However, Amas Nigeria will update this page and inform you about When 2018/2019 JAMB Registration Will Start On Jamb Profile. JAMB 2018/2019 Exam Date And Registration Form Release Has Finally been decided. See When Jamb Form Would On Sale For 2018/2019 Session And Also When Registration Will Start On Jamb Profile. Keep reading to get the latest updates on JAMB 2018/2019 . If you are a prospective candidate for JAMB 2018/2019 cut examination and you’ve been wondering the nature of 2018 JAMB would look like, it mean the information here is just for you. Unlike 2017 JAMB registration that started Monday 20th March to May 5th 2017, JAMB 2018/2019 would Out between December 2017 and January 2018. The exam date will likely be around March and April 2018. Do you want to be guided on Jamb 2018/2019 form application , reprinting of examination and result slip, JAMB profile and correction of details, change of institution ? Do you want know Jamb 2018/2019 latest news updates on Admission status, no results yet, awaiting results, change of courses and institution, With every other information about 2018 Jamb UTME And Direct entry? If your answers to the above questions is YES, it means this information is for you . We promise that you will gain a lot of information as you read on. WHAT YOU SHOULD REALLY EXPECT: The 2018/2019 JAMB witness Strick registration and strict guidelines for the examination. This will help curb the issue of examination malpractice. However, JAMB 2018/2019 will not be different from Jamb 2017 in the aspect of setting question. Just like in the past, UTME 2018 will be simple and repetition/modification of past questions. Is It JAMB Or School That offers Admission? This question comes up yearly when students dare waiting for Admission list. A lot f students are confused if it is either JAMB or your university that gives admission. Just as it has always been, your name is expected to appear on JAMB Website and also, your school website. The joint Admission and matriculation board has released the result for those who wrote Jamb 2017’18. If you could not see your result online earlier, you may want to check again. All you need to do is visit jamb portal and login with your username and password; then click on check result in your Jamb profile. As from June to November 2018, Jamb 2018/2019 Admission lists will be released. When you are finally admitted, you can then proceed to print your Jamb 2018 Admission letter. It is true that you have checked and printed your normal Jamb result slip. But that is not what you will use for your University 2018 clearance. Your University or Polytechnic of choice will require you Origin clearance during physical clearance. Usually, Jamb sells scratch cards to enable you print Original Jamb result. JAMB 2018/2019 DE: Jamb direct entry registration and screening will be announced and confirmed by the Joint Admission And Matriculation board. Jamb will send examination centers and dates for 2018 utme applicants. 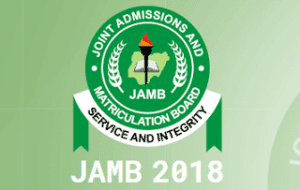 STEPS FOR JAMB 2018/2019 REGISTRATION AND APPLICATION. For Jamb 2018/2019 registration, No candidate should register at any centre other than the accredited CBT centre and JAMB State office. Any candidate who is registered outside approved centres will be identified and disqualified. Registration fee for the 2017 Unified Tertiary Matriculation Examination or Direct Entry was Five Thousand Naira (₦5,000) only. JAMB 2018/2019 would be the same. What novels are we to use for Jamb 2018? Candidates are also, as usual, to pay Five Hundred Naira (₦500) only to obtain the reading text- “In Dependence” for UTME candidates and “The Last Days at Forcados High School” for Direct Entry Candidates. This is to avoid exploitation, off-line registration, mismatch of candidates’ particulars and other registration-irregularities. After registration, a lot of students usually complain to have made one or two mistakes in the process. The best way to avoid costly mistakes during registration is by doing your registration at the various recommended centres. Without your JAMB profile, you cannot register for 2018 JAMB. This means that all prospective jamb candidates are expected to register their profile on JAMB website. You can check out JAMB profile registration Procedures here. It is free. There’s is no way you will make mistakes if you follow the steps we have provided below. Kindly follow the link. If you do not know the registration procedures for 2018 JAMB, we advise that you read it here. 2017 JAMB: Banks to buy JAMB Form or JAMB E-PIN?